Last night I was in the mood for idli or dosa but did not have the batter ready. The idli/dosa batter usually takes time preparing (6hrs to soak the ingredients and 6 hrs to ferment the ground batter). So I decided to make Adai as it takes about 2hrs to soak, grind, ferment and to prepare. Adai is pretty filling and high in protein as different varieties of dal are used. Soak rice and all dal ingredients together in enough water for 2hrs. If you are in a real hurry 1hr should be enough. Grind all the above ingredients to a dosa batter consistency. It is fine if the mix is a little course. Also if you are using an US bought blender, grind the above in batches as the motor heats up pretty fast. If you are using an Indian blender/mixer or a wet grinder then everything can be ground together. Let the batter sit for 15 min. 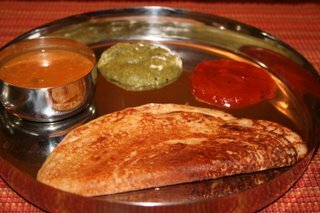 Heat a dosa tava (flat gridle) and add a laddlefull of the batter in the middle and spread it around like you would for a dosa or a crepe (refer to the picture). Once the bottom is cooked flip the adai and let the other side cook. 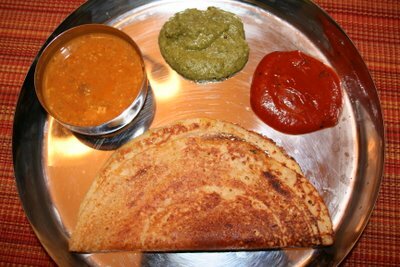 Remove the adai and serve it with chutney or sambar of your choice. Traditionally adai is served with a piece of jaggery and a dish called avial. Variations : Blanched and chopped spinach, finely chopped onions can be added to the adai batter before making the adai. Heat oil in a pan and add channa dal, red chillies, ginger, garlic and chopped pudina and coriander leaves. I also use the upper part of the pudina and coriander stem for the chutney. After the leaves reduce in volume remove from fire and let it cool. Grind the mixture along with tamarind extract, channa dalia, salt and water as needed to make a fine paste. Heat oil in a pan, add seasoning ingredients and once the mustard seeds start to splutter pour the seasoning into the chutney. This can be served with idli, dosa and also roti/chappathi. Deepa...Kalakku...the items you made really look tempting...Hope I can taste some of this stuff when I come over ...! deepz, i would like to add a point when it comes to adai. In the adai we make we add all equal proportions of Raw rice, Boiled Rice (puzhungal arisi) , chana dhal and thoor dhal. We dont add urid dhal which is mainly used for idli and dosa. Let me try this too. 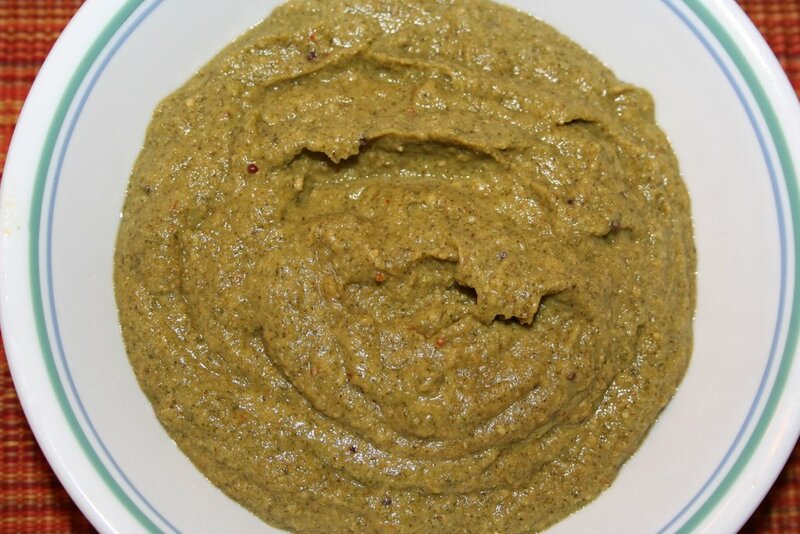 One more tip is if you add coconut while grinding the adai batter it adds a great taste too. thanks for the suggestion and also I did add coconut but forgot to mention it. This is what happens when I cook and write it down 2 hrs later. Thanks for correcting me. the adai looks good. but you didn't tell about whether to add or grind the chillies,coconut,curd jeera.can you please reply. The recipe sound great. You should post them on www.samukam.com social network in the Tamil recipe/food section.